Thousands of Leave supporters have protested at Westminster against the delay to Brexit, on the day the UK had been due to leave the EU. 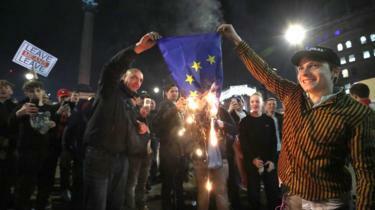 Some demonstrators reacted with cheers, while others shouted “shame on you”, as MPs rejected Prime Minister Theresa May’s EU withdrawal agreement. 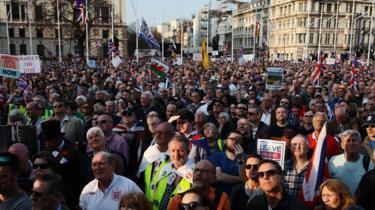 The March to Leave – which began in Sunderland two weeks ago – arrived in Parliament Square on Friday afternoon. 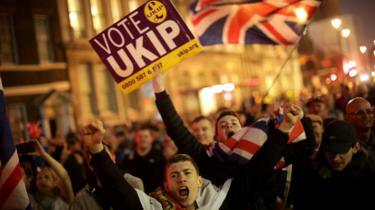 A separate Make Brexit Happen rally, organised by UKIP, was also held. 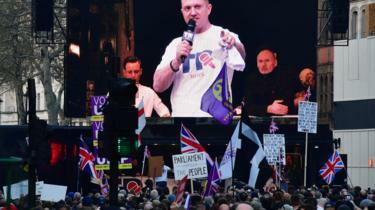 The rally was backed by English Defence League founder Tommy Robinson, who spoke to crowds, along with UKIP leader Gerard Batten. Meanwhile, at the March to Leave protest, former UKIP leader Nigel Farage and Tory Brexiteer MP Mark Francois delivered speeches. 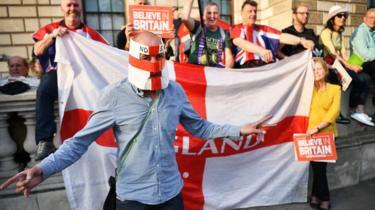 A counter-protest by the group Stand Up to Racism also took place in Westminster. 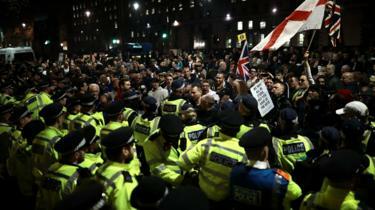 Some Brexit protesters continued to demonstrate into the evening, and lines of police were deployed to keep the crowds under control. 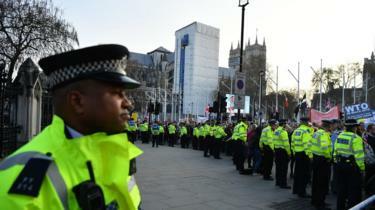 The Metropolitan Police said five arrests had been made at the demonstrations – although that included one man who was wanted in connection with an offence elsewhere. Two other people were arrested on suspicion of assault, another on suspicion of assaulting a police officer and someone else on suspicion of being drunk and disorderly. It comes as MPs on Friday rejected Prime Minister Theresa May’s withdrawal deal which she negotiated with the EU, by 58 votes. The UK had been due to leave the EU on 29 March, but both sides agreed to postpone the date last week after Mrs May had twice been unable to get her Brexit deal through the Commons. Friday’s defeat of the withdrawal agreement led to mixed reactions. Some in the crowd, who saw Mrs May’s deal as too soft, welcomed its rejection, while others feared it could lead to another EU referendum. 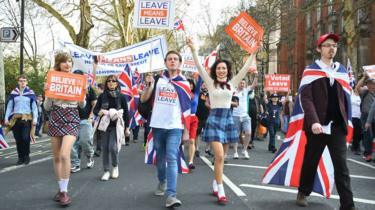 Former UKIP leader and Brexiteer Nigel Farage spoke at the March to Leave rally – organised by campaign group Leave Means Leave – and was greeted by loud cheers as he took to the stage. “It’s brave of you to come,” he told demonstrators. 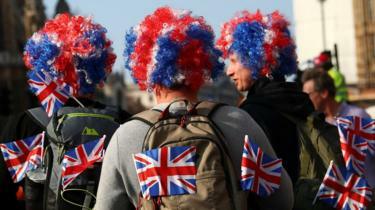 “Because I sense, being in Westminster, that we are in enemy territory. 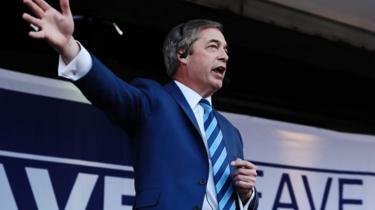 Mr Farage told Leave supporters “not to be disheartened”, and also signalled that he would be willing to stand again as an MEP if the UK takes part in the European Parliament elections in May. The UK has a new Brexit deadline of 12 April, by which point it needs to have told the EU what its next steps are. If the UK wants to delay Brexit further, the EU is expected to insist that it takes part in the elections. 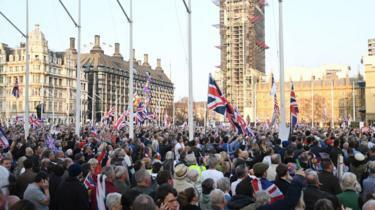 The mood and atmosphere in Parliament Square is very strange for a demonstration. There is a really significant police presence, yet a lot of quiet but angry, angry people who believe that Parliament has “betrayed” Brexit. 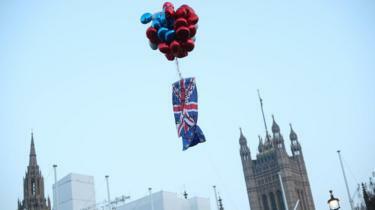 When the news came through that MPs had, yet again, refused to back the PM’s draft deal, the reaction was rather muted. George, from St Albans, told me he was satisfied, because he hoped the UK could now crash out without a deal, as the public demanded. 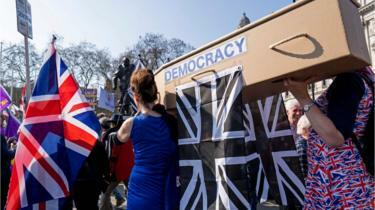 One man has a coffin as a prop, declaring the death of democracy. “Bring out your dead,” goes the prop’s recording. 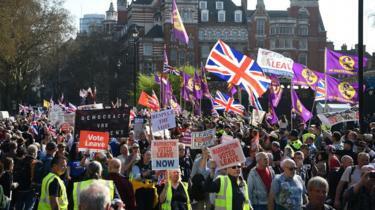 UKIP leader Gerard Batten told the crowd at the Make Brexit Happen protest: “As of now we do not know when we are going to leave the European Union. Mr Robinson, whose real name is Stephen Yaxley-Lennon – also took to the stage, addressing the confusion over the latest defeat of the deal: “So Theresa May has lost her vote. Many people will be asking what does that even mean. The BBC’s Sarah Walton, who was also at the scene, said there were some pro-Remain campaign groups demonstrating in central London. Some of the protesters wore hi-vis yellow vests, like those worn by the “gilets jaunes” anti-government rioters in Paris. Former black cab driver Colin Grostate, who was at the demonstration, said they were a “symbol from France”, adding: “We support the populism. Campaign group Stand Up to Racism also held a counter-protest in central London, saying it was there “against the far right who are trying to capitalise on the Brexit crisis”. The Metropolitan Police said it had “appropriate policing plans” in place.